Today’s Home Office main story is the launch of the Serious Violence Strategy. Today the Government is launching its Serious Violence Strategy. The strategy which will be launched by the Home Secretary in a speech today is backed by £40m funding and marks a step-change in how we tackle violence including knife crime, guns and acid attacks. There is widespread print coverage in the Times, Telegraph, Guardian, Independent, Mail, Express, Mirror, Telegraph, Sun, Star, and Metro of the Serious Violence Strategy. 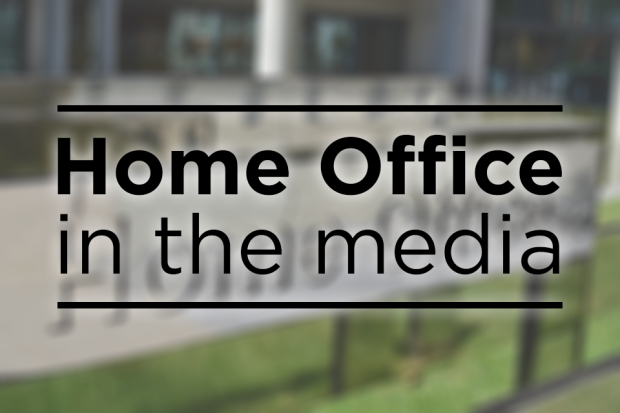 The Home Secretary Amber Rudd and Parliamentary Under Secretary of State for Crime, Victoria Atkins, have also completed a media round this morning. The Times and Independent report that the new strategy highlights the particular problem where drug gangs seek to move into new areas, often using vulnerable individuals to transport the drugs, in a practice known as “county lines”. On the drug angle, the Telegraph reports that cocaine 'loyalty cards' are enticing the middle class into funding gang violence. The papers note the Home Office will create a £3.6 million new National County Lines Coordination Centre. The Guardian splashes on a leaked Home Office document, which the paper claims casts doubts on the Home Secretary’s remarks today that cuts to police are not to blame for rising violence. The Mail reports that the strategy's focus is on social media companies to do more to remove violent gang content and tough restrictions on online sales of knives. The paper includes a box-out on comments by Trevor Phillips who calls for stop and search tactics to be used more widely. The Home Secretary and Crime Minister also appeared on broadcast this morning on Radio 4’s Today Programme, Good Morning Britain, 5Live, LBC, BBC Breakfast and Sky, with the focus of the interviews largely on police cuts, following the Home Office leaked document, as well as stop and search powers. Both the Home Secretary and Crime Minister reiterated that it was much more complex than just policing numbers and that the serious violence strategy focuses on other areas and commits £40 million to the Early Intervention fund that targets young people that are most at risk of being exploited by gang leaders. The Home Secretary was also asked about stop and search on the Today Programme and she said it has to be much more intelligence-led than it used to be in the past. This strategy represents a real step-change in the way we think about and respond to these personal tragedies, these gruesome violent crimes which dominate the front pages of our newspapers with seemingly depressing regularity. A crucial part of our approach will be focusing on and investing more in prevention and early intervention. We need to engage with our young people early and to provide the incentives and credible alternatives that will prevent them from being drawn into crime in the first place. This in my view is the best long-term solution. Because what better way to stop knife crime than by stopping young people from picking up knives in the first place? As a Government we will never stand by while acid is thrown or knives wielded. I am clear that we must do whatever it takes to tackle this so that no parent has to bury their child. A factsheet on the Serious Violence Strategy can be found below. The Home Office will today (Monday 9 April) launch the Serious Violence Strategy, which will set out the Government’s response to the recent increase in knife crime, gun crime and homicide. Homicides and knife and gun crime account for around 1% of all recorded crime, but the impact of serious violent crime on society is significant. There is a huge cost to individuals, families and communities through loss of life, and the trauma caused through both the physical and psychological injuries suffered. Violent crime has seen very substantial reductions since its peak in the mid-1990s as recorded by the Crime Survey for England and Wales, regarded as the most reliable independent survey of crime. Violence with injury in the year ending September 2017 was 40% lower than in the year ending June 2010 and 76% lower than its peak in 1995. However some types of violent crime recorded by the police have shown increases since late 2014. Crack-cocaine markets have strong links to serious violence and evidence suggests crack use is rising in England and Wales. This is probably driven by supply and demand factors. For supply, cocaine production and purity have soared. For demand, there was a 14% increase in the number of people presenting to treatment services with crack cocaine problems between 2015/16 and 2016/17. Drug-related cases also seem to be one of the driving factors in the homicide increase in the US. Drug-market violence may also be facilitated and spread to some extent by social media. A small minority are using social media to glamorise gang or drug-selling life, taunt rivals and normalise weapons carrying. Changes in the drugs market have also resulted from the expansion of county lines activity with its associated violence and exploitation. our work to tackle knife crime that was set out in the Modern Crime Prevention Strategy published in March 2016 and which includes the voluntary agreement with major retailers on sales of knives, banning zombie knives in August 2016, and support for national weeks of action against knives by police forces under the Operation Sceptre banner. We have been supporting early intervention and prevention work, often through the voluntary sector, such as youth workers from Redthread who are based in hospital emergency departments and Young Peoples Advocates, who work with gang affected young women and girls. We have also provided support for local communities working with young people and young adults at risk through the EGVE Fund, the Serious and Organised Crime (SOC) ‘Prevent’ Local Pilots fund which supports projects to stop vulnerable individuals from involvement in SOC offending or re-offending, and the anti-knife crime Community Fund. The Government has also undertaken work to prevent firearms getting into the hands of criminals including: tightening up legislation on firearms in the Policing and Crime Act 2017; making changes to the licensing regimes to make it harder for weapons to move from legal to illegal ownership; establishing the new National Firearms Threats Centre in 2017; and support for joint work by police forces, the National Crime Agency and Border Force on operations to tackle the illegal supply of firearms through our borders. The Serious Violence Strategy proposes further action under three key themes: early intervention and prevention, supporting communities and local partnerships and effective law enforcement and criminal justice response. It also sets out the action we are taking around tackling county lines and misuse of drugs. Tackling County Lines and Misuse of Drugs - We want to tackle the significant role of drugs and county lines in serious violence. This chapter in the strategy sets out the measures to tackle county lines, which includes the creation of the new National County Lines Coordination Centre to strengthen significantly our response to tackle this violent and exploitative form of crime. Deliver a second phase of activity under our County Lines Action Plan to tackle county lines, to consolidate and build on the work undertaken to date and address new and specific threats and challenges. Provide £3.6m funding to support the development of the new National County Lines Co-ordination Centre (NCLCC). Continue to work with the Crown Prosecution Service and NPCC lead on the prosecution of county lines encouraging the use of Modern Slavery Act offences where appropriate. Undertake nationwide awareness-raising communication activity about the threat of county lines targeted to young and vulnerable people and how to avoid becoming involved and exploited by gangs. Early Intervention and Prevention – We must prevent people from committing serious violence and being drawn into exploitation by building resilience, supporting positive alternatives and providing timely interventions at the “teachable moment”. This chapter in the strategy signals our intention to deliver a step change in early intervention and prevention and outlines proposals for action which support interventions to help young people and young adults to live positive lives away from violence. The Home Office will provide £11 million over the next two years through a new Early Intervention Youth Fund to work with Police and Crime Commissioners and Community Safety Partnerships (or equivalent) to provide joined up support to youth groups and communities to support early intervention and prevention with children and young people. Providing £13m over the next four years through the Trusted Relationships Fund to pilot approaches which provide support to at risk young people to build positive and trusted relationships with adults who are there to support them. Supporting Redthread to expand and pilot its Youth Violence Intervention Programme outside London, starting with Nottingham and Birmingham, and to develop its service in London hospitals. Supporting Communities and Local Partnerships – We want communities and local partnerships to be at the heart of our multiple-strand approach to tackling serious violence. This chapter sets out measures to help communities to build resilience and respond to serious violence. It also sets out measures to support vulnerable individuals, communities and the wider public through encouraging partners to take action to reduce the opportunities for crime to take place, including raising awareness of the key issues and how best to respond. We will continue to work in partnership with the police, youth services, private sector, local authorities and the voluntary sector. Continue support for local initiatives to tackle knife crime through further rounds of the Community Fund in 2018/19 and 2019/20. Work with Police and Crime Commissioners to prioritise and identify what action they are taking against serious violence, including knife crime, in their annual Police and Crime Plan. Effective Law Enforcement and Criminal Justice Response – We will pursue those who commit serious violent crime through effective law enforcement and ensuring that the criminal justice system is effective and responsive, especially for victims. The chapter sets out how the Government is planning legislation to support improved law enforcement and is tightening up the legal framework on firearms ownership to prevent such weapons getting into the hands of criminals. Work with the NPCC lead to implement more preventative measures in respect of online video platforms encouraging gang related violence and take action against illegal material posted online. Continue to support police forces to take action against knife crime with co-ordinated national weeks of action under Operation Sceptre. Following the consultation in late 2017, tightening up legislation on knives, corrosive substances and firearms, including action in relation to online sale of knives.